Keeping an eye on what’s going on in the 3D printing market on a daily basis, as well as perusing and publishing the monthly reports from 3D Hubs (which are extraordinarily helpful), it’s plain to see that while North America is still in the lead in terms of 3D printing, Europe is close behind. And while 3D Hubs reports more on the smaller production front, it’s interesting to see how that parallels with larger markets worldwide and projections–specifically for automotive, which is one of the biggest industries embracing 3D printing for affordable, high-quality components. From the small stage to a larger one, data seems to run concurrently. North America indeed is still the forerunner while the European and Asia Pacific markets seem to be held back for obvious reasons, such as lack of exposure to the technology–and as is expected in the beginning–an initial reluctance by many. According to this report by MarketsandMarkets, however, in the future, as far as automotive is concerned, we will be seeing a seismic shift in the current scenario. Europe will pull out into the forefront, with North America projected to fall into at least third place, behind Asia-Pacific. This concept has been brought to the surface before regarding patents that soon expire and allow for new manufacturers to step into place. 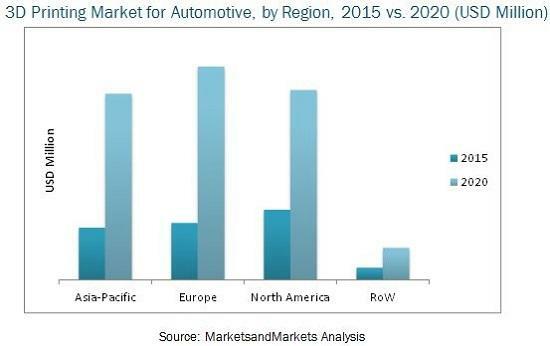 In Europe, it is indeed expected to be the automotive 3D printing market that sees the huge spike–predicted at 30.29% from 2015 to 2020. 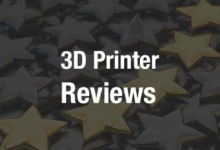 Affordability has been a big topic regarding the 3D printer and its subsequent and continual rise in popularity. While at first it was an intimidating technology with an intimidating price tag, much of that has changed with a much more mainstream attitude nearly everywhere as well as a 3D printer that can be matched to nearly anyone these days for both price and skill level. Not surprisingly in terms of material, metal 3D printing is expected to overtake that of 3D printing with polymers. A process using a material that allows for great durability and strength, its attributes speak for themselves. The report sees sales for 3D printers rising quite exponentially, to the tune of 36.03 % in the next five years. Who will be buying all these machines? Everyone, pretty much. From engineers to hobbyists, it’s going to turn into a question of who does not have a 3D printer at the desktop. All in all, aside from the pretty startling projection that Europe may soon exceed us in 3D printing interest and activity, the report holds few big surprises. The general consensus all around seems to be that we have plenty more to explore with 3D printing–and the sky continues to be the limit. Will Europe continue to lead this space over the long run? 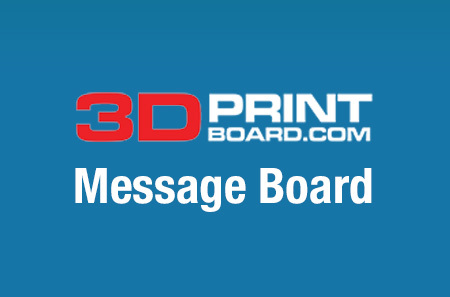 Let us know in the 3D Printing Automotive forum thread on 3DPB.com.